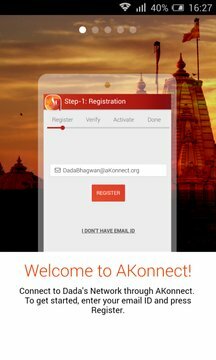 Dadabhagwan foundation brings you AKonnect (AKram cONNECT) – an app where you can stay up to date with information on Satsang, Live Satsang, Tele-Satsang, Pujyashree’s latest updates, Website updates, daily Aptasutra and Energizer! 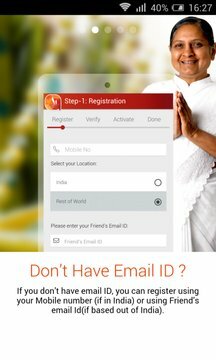 •	Get the latest updates and announcements from your local satsang center. •	Choose what you see. Subscribe to categories you wish to receive updates on. These settings will automatically be saved to your email profile and will reflect on any device you use the same email address on. •	Like what you see? Share it on various platforms. Come - discover, connect, and share from anywhere in the world with AKonnect! -Download and install the app. -After installation, you will be asked to register via your email address. If you don't have an email address, you can use your phone number. -After you register, you will receive a verification code via Email / SMS. Enter this code and click on 'verify'. -You will be redirected to a page where you will need to fill out your profile details (Name, Country, State, City & Center). Some of this information may already be auto filled. -You can then activate your profile by clicking 'Activate'. You are now connected! You will now receive all the updates shared via this app in your inbox.